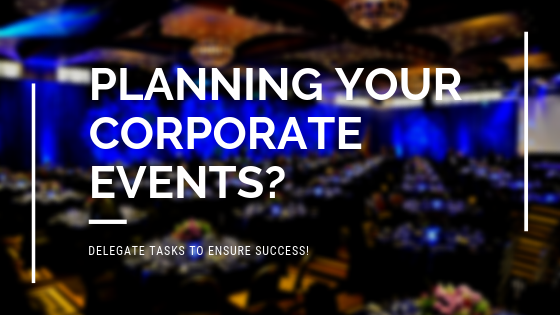 Planning your corporate events? Delegate tasks to ensure success! Planning your corporate events such as functions and galas is no mean feat, especially when you choose to go it alone without the assistance of a party planner. It can feel overwhelming at times, so you shouldn’t be afraid to reach out to those around you and ask for help. Not only will this save you time and stress, but it can also provide a new perspective on how your big event will play out. So where do you start? Divide key responsibilities into the following areas and delegate them to your colleagues. Before you know it, you’ll be well on track to throwing the party of the season. Arguably one of the most important components of any good event, sound and lighting can be one area where planners fall down. Just because your event has lights already installed doesn’t mean you have to use them! Ask the person in charge of this area to get in touch with an audio visual equipment specialist and discuss the options with them. A professional will be able to tell you what will enhance your venue and make your party really pop, whether it’s a slideshow programmed to music that highlights your company’s key strategies or more playful lighting effects that bounce off the walls in time to your party playlist. Your sound and lighting helper should also make sure they get good quality speakers to let the music float across the room without the need for anyone to strain to hear. While you may want to be heavily involved in selecting and inviting your guests, you should consider asking someone to keep track of RSVPs, dietary requirements and other special information that will be filtered through from guests in the lead up to the day. The assistant can set up a spreadsheet to track who is coming, if they have any requests or suggestions and who has yet to reply. He or she can them chase up those who haven’t confirmed their attendance while you focus on more important matters – like the food and drink! MC, speakers, music, videos and entertainers are just a few of the options to choose from when it comes to keeping your guests engaged and entertained. Pulling together an event that will be remembered and not forgotten is imperative to the success of the outcomes from your event. Make sure you choose a creative thinker with an organisational streak to help you organise the best possible entertainment that fits your budget. To achieve outstanding results put this person on a team with the sound and lighting delegate. If you are looking for a sound and lighting event partner that has been in the corporate event industry for almost 30 years then look no further than Pro Light & Sound. Our experience means that we are able to achieve the best possible results within time and within budget.